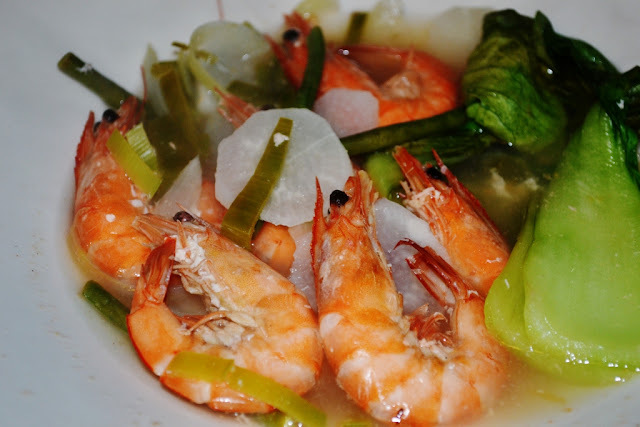 Sinigang uses sour ingredients such as tamarind or lemon to create a deliciously tart and spicy broth. 1 Bring the rice water and lime juice or lemon juice to a boil in a saucepan. Reduce the heat and simmer for 15 minutes. 2 In the meantime, heat the oil in a skillet and stir-fry the garlic until golden brown, then stir-fry the onion until translucent. Add the tomatoes and cook until they soften. Add this fried mixture to the saucepan with the rice water. 3 Add the daikon radish and bring to a boil again. Reduce the heat and simmer until the daikon is tender but still crisp, about 7 minutes. 4 Add the shrimp, chilies and watercress, and cook until the shrimp turn pink and the vegetables are wilted, about 5 minutes. Season with the fish sauce and pepper. 5 Ladle the stew into a large bowl and serve immediately with boiled rice. Note: To prepare rice water for this recipe, mix 8 cups (2 liters) water with 4 cups (800 g) uncooked rice. Stir and strain, reserving the rice water.